Every year in June, teachers say farewell to students for another year, schools say farewell to students graduating/articulating, and adults say farewell to colleagues and friends. Retiring from education is a celebration. I have attended many retirement celebrations through the years for so many powerful educators that dutifully served education for 20/30/40 years. In June of 2015, my friend and one of my mentors bids farewell to a commitment to education like none other. She is small in stature, and a hero at that size! Eileen Walters is retiring from her role as the Instructional Technology Specialist at Contra Costa County Office of Education after 12 years. She embodies all the characteristics that are the very best of every teacher: grit, curiosity, hope, and a dedication to professional growth. She doesn’t get a lot of the spotlight. She is behind the scenes often, making magic happen supporting others. On the topic of support, Eileen did this for me. 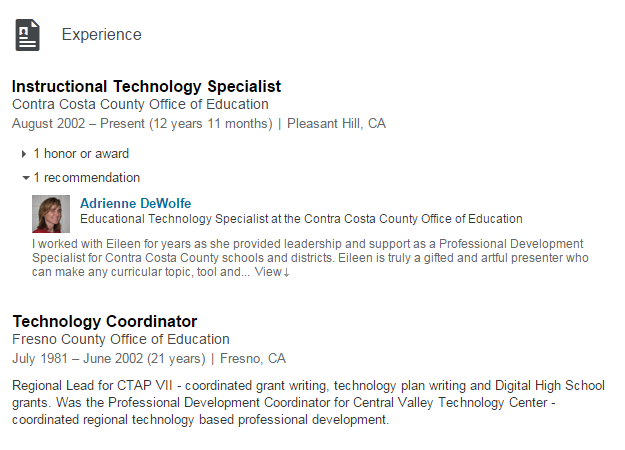 In 2003, I was a new Administrator in my Educational Technology Coordinator role. She spent countless time getting me up to speed on initiatives, gaining my understanding of complex systems, and pushed me for excellence in my work. She doesn’t like recognition, prefers to plug away. I won’t let her go that easy. Eileen stays with me setting the tone as I embark on projects, train teachers, and push limits. Eileen reminds me to expect excellence in others, set guidelines, check their work. From my time working closely with her for 9+ years on a regular basis, calling her every time I hit a crossroads, and bugging her often for support; I am a better professional. Thank You now, often, and always. 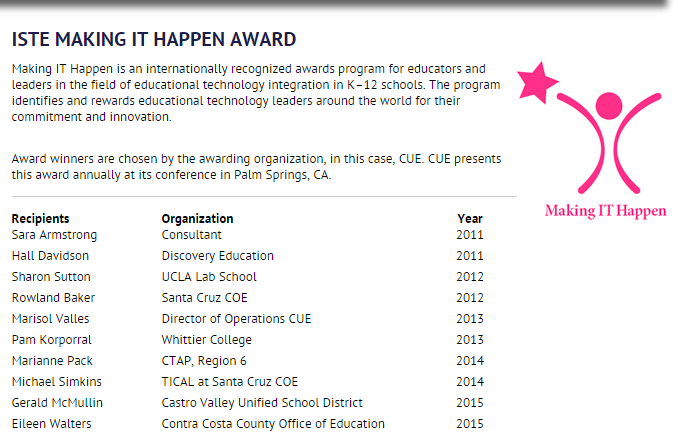 Her newest project- (She has had many too) is the Leading Edge Certification for the Professional Learning Leader is being developed under the leadership of the Certification Chair, Eileen C. Walters. This tells me we can work together again. For this, I am very grateful.